David Evison, the British sculptor, was passing through town last week, and the two of us went sightseeing. Among the sights we saw was a perfectly delightful exhibition at Leslie Feely, entitled “Major Formats: Frankenthaler, Noland, Olitski, Christensen, Poons & Dzubas” (on view through January 11, though the gallery will be closed on December 24, 25 & 31, also January 1, 2014). The show occupies the two galleries of Feely’s space at 33 East 68th Street, and if you ask politely, she may also open the door to the office at the back, which has more exciting work. In the past, I’ve sometimes found that paintings at this gallery have been taken down and shipped off to new owners before the advertised ending of the exhibition in question, but this time, Feely swears that all will remain on view until January 11, and maybe even a bit later. Not all the works on view satisfied my companion, but I found so much to love that I’m not complaining. I will say that Christensen’s “Yellow Bumper” (1970) looks to me more like a Brice Marden from the 60s than any previous works by Christensen from this period that I’ve seen, and the Frankenthalers are from later periods in her career, but two of the four paintings by Olitski are majestic spray paintings from the mid-60s, a vintage period, and a third, “Hyksos Factor III” (1975) catches the artist square in his mellowest maturity. Poons has two fine paintings here, one with brightly-colored & semi-transparent ellipses from the mid-60s, and one of his vertical grey-on-grey pourings from 1976. The big Dzubas, “New Light” (1973), likewise captures this memorable artist after he’d achieved the breakthrough to his mature style. Its large, loose shapes & radiant colors reminded Evison that Dzubas had been helped to achieve shapes & colors like these through study of the ceiling frescos by Franz Anton Maulbertsch, the 18th century Austrian rococo artist, in the Piarist Church of Maria Treu in Vienna (a church also noteworthy for possessing an organ once played by Anton Bruckner). 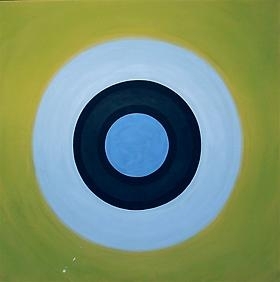 I yield to no one in my admiration for Dzubas, but really the star of this show is the Noland target, “No End” (1961). Ultra-simple in its composition, with only two broad circular bands of luminous blues, plus a center blue disc and a surrounding green field, it mysteriously reminds me not only of a giant eyeball, but also of an oculus, perhaps in the roof of a Pantheon, with a view through to a sky of deep and deeper blues, surrounded by a crystalline green ceiling.